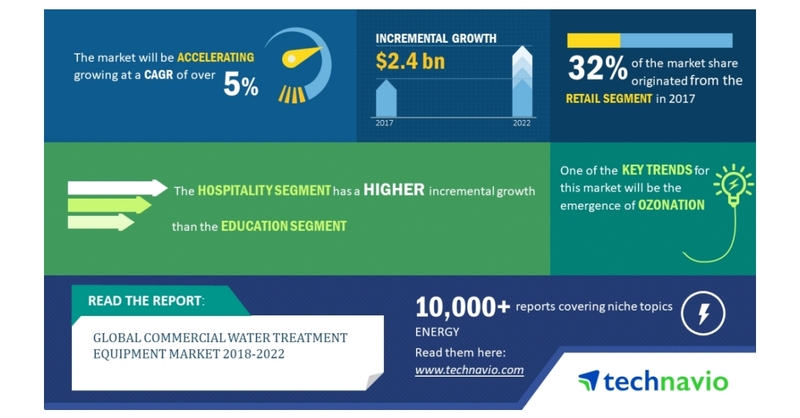 LONDON–(BUSINESS WIRE)–The global commercial water treatment equipment market is expected to post a CAGR of over 5% during the period 2018-2022, according to the latest market research report by Technavio. A key factor driving the growth of the market is hard water and other contaminants hampering food service equipment quality. In the food and beverage industry, water is used for general processes, cooling applications, and boiler feed purposes. Water used for general purpose accounts for the highest proportion of the water usage in the food and beverage industry. The water should be potable, clear, colorless, and free of contaminants that affect taste and odor. In-plant chlorination treatment is required to reduce the microbes on raw materials, prepared products, and equipment surfaces. This market research report on the global commercial water treatment equipment market 2018-2022 also provides an analysis of the most important trends expected to impact the market outlook during the forecast period. Technavio classifies an emerging trend as a major factor that has the potential to significantly impact the market and contribute to its growth or decline. Ozone is an unstable gas consisting of three oxygen atoms. The gas readily degrades back to oxygen. As a result, a free oxygen atom or radical is formed during the transition. Its oxidizing properties can reduce sulfur, manganese, and iron concentration levels. Ozone oxidizes these metal contaminants in the water to form insoluble metal oxides or elemental sulfur. The resulting particles are insoluble and can be filtered through coagulation or chemical oxidation. Ozone also eliminates taste-and-odor-related impurities. “Ozone is effective over a wide pH range and rapidly reacts with bacteria, viruses, and protozoans. It has a very strong oxidizing power and a short reaction time. Moreover, the treatment process does not involve the addition of chemicals to the water. Thus, ozone is widely used for drinking water treatment. Ozonation is recommended prior to sand filtration or active carbon filtration. These filters aid in the removal of organic and inorganic matter, and micropollutants such as pesticides,” says a senior analyst at Technavio for research on water and waste management. This market research report segments the global commercial water treatment equipment market by application (retail, hospitality, education, and food service) and geographical regions (APAC, EMEA, and the Americas). The retail segment held the largest market share in 2017, accounting for nearly 32% of the market. This application segment is expected to dominate the global market throughout the forecast period. The Americas led the market in 2017 with a market share of nearly 37%. However, by 2022, EMEA is expected to surpass the Americas to become the leading region, accounting for a market share of nearly 36%.